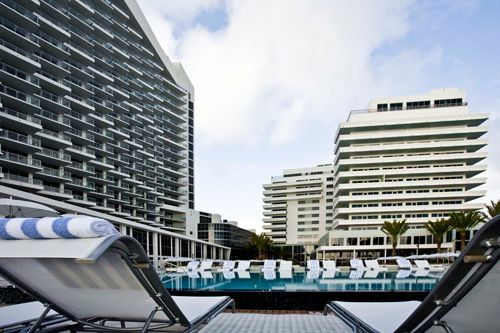 Upon completion of Miami hotspot the Eden Roc Renaissance Miami Beach hotel in 1956, architect Morris Lapidus, who also designed neighboring "It" hotel Fontainebleau, declared, "I didn't want any of that French stuff used at the Fontainebleau. At Eden Roc, I want people to come in and fall on their backs." Fortunately none of its clientele reportedly took a tumble upon the black and white terrazzo floor in its heyday, but let's not rule out the possibility of guests being gobsmacked by Eden Roc's new $200 million renovation opening just in time for Art Basel this week. The lavish decor that was once deemed a vision of the Italian Renaissance is still apparent (think vanilla marble, poolside Pan fountains, and gleaming brass elevator door detailing). The legendary landmark's sleek new 21-story Ocean Tower redesign includes 631 oversized guest rooms, bi-level bungalow suites with floating staircases, cascading infinity-edge pools and four restaurants (including a new and improved take on the historic Cabana Beach Club). A 21,000-square-foot spa is slated to open early next year and the historic Cafe Pompeii where Nat King Cole hosted supper shows once upon a time has been replaced with a 10,000-square-foot grand ballroom. Gone, sadly, are the authentic Al Hirschfield cartoons that adorned the walls of the lobby (formerly Harry's American Bar, where Ernest Hemingway was a regular). Gone, but not forgotten, as guests can now find Hirschfield's caricatures imprinted on the cocktail napkins.